It might be yours for only half a million ! Highlights in 100 years of Mercedes ! Since the 50's, i.e. over nearly 50 years, the large star at the frontside proves a Mercedes-Benz as an SL (Super-Light: two-seat roadster, i.e. convertible; sometimes misinterpreted as Sport and Light) or an SLC (Super-Light-Coupe: hardtop coupe; sometimes with two narrow jump seats in the fond). In 1981 DB presented a new coupe of the S-class model line W126, the C126 or SEC (S-class, meaning Senior line + engine with fuel injection = Ger. Kraftstoff-Einspritzung + Coupe) which removed the W107 SLC. It was the first real 4-seat S-class coupe after the splendid W111 Coupe. Actually, the models W108/109 represent the so called "New Generation" (nowadays "Old S-class") of the 60's (1965-1972), but the W111 Coupe and Convertible (Cabriolet) was based on the "large fintail" (Ger. "Heckflosse"). Clever designers, however, had realized the symptoms of that time and omitted (as later on at the W108/109 too) the fintails at the coupe and convertible. A great model line was created, which then had been produced for over 10 years (1961-1971). It made a W108/109 coupe unnecessary, it was fully "enough S-class". By the way, choosing at some time S for an upper-class Mercedes, may be, was not a very long-sighted decision. To use this abrevation for "Sport" was blocked forever. Possibly, the clientel one had in mind, in average, had passed the sporty years. 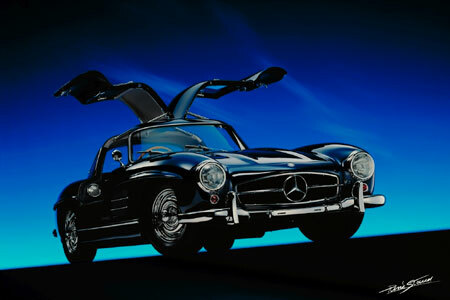 But L for "Luxury" was also occupied since the 300SL, moreover, S also means Super. "Super Seniors", o.k.! An MB fan, for sure, will tolerate this because it hits the nail squarely on the head. But the "general disaster" was programmed. Later on, the 4-seat coupes changed to the middle-class till 1981; so the W114/8 250C/CE (1968-1972), 280C/CE (1972-1976) - so the W123 Coupe: 230C (1977-1980), 230CE (1980-1985), 280C (1977-1981), 280CE (1977-1985). 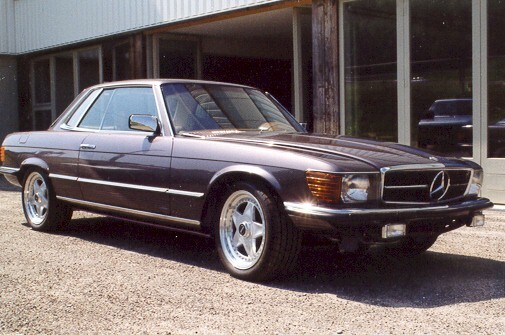 Some S-class coupe of the model W116 (1972-1980) does not exist as well. The W123 230/280CEs with their 6-cylinder injection-engines are really "smart" cars. However, the superior V8-engines (already introduced in the W111 Coupe in 1969 and then used for the W116 350SE/SEL, 450SE/SEL and the W107 350SL/SLC, 450SL/SLC) should be reserved for the exclusive "new S-class" W126 coupes: 380SEC (1981-1985) and 500SEC (1981-1991). The match of the progressive W126 with the "C107" led to the SEC. For a time the C had been used a little more "consequent" ! From the present point of view, the C126 is the last "classic" coupe of DB. The upgrades of the W126 in 1985 then borowed the "stepchild" 420SEC but also the non-plus-ultra 560SEC. The 500SEC, however, remained the over-all most successful C126 model. In the beginning of the 80's, the globalized market enforced DB to break with great traditions. The split up of the SEC from the up to now most successfull SL R107 (1971-1989 !!!) was the very first barely remarkable step to the nowadays large variety of Mercedes models. The C215 (CL !) being the coupe to the S-class W140 (1991-1998) followed the C126 only in 1999 when the W220 already had removed the W140. But this S-class coupe (unfortunately) shows the pert 4-eyes face of the new E-class W210 (1995-2001). And what is the meaning of L now ? This coupe is by far no Light one, much more some very Luxury. The roadsters R129 (1989-2001), R230 (2001 ...) continue the SL-line of the R107, and parallely the newly-developed R170 (SLK = Super + Light + Ger. Kabriolett for convertible) with its fully automatic metal top marked a new technical MB-highlight in 1996. All these SLs and S-class coupes proudly carry the large star at their frontside, somelike remembering us delicately that an SL indeed was an S-class car at all time. The conflict took its way with the C-class W202 where C now means "Compact". In 1983 DB presented the W201 (called the "190" or the "small Benz"). This new "Entrance model" quickly conquered the market meeting the idea of a broad MB clientel. Finally its face aparently showed little similarity with the famouse S-class, and that for a much lower price ! In 1993 the W202 (1993-2000) removed the W201 and, from that time on, was called C-class. It now became more similar with the W124 (1985-1996) which had removed the W123 in the middle-class and then was called E-class (E= Ger. "Einstiegsmodell", "Entrance model" !) since 1993. In this way for good the last wrong ambition could be corrected but the confusion in terminology was getting nearly perfect. After the shut down of W123 CE-production in 1985 one had to wait for the next middle-class coupe till 1987. "Less chrome and better aerodynamics", already characteristic for the S-class W126, became also one of the current principles for design of the W124 (1985-1996). "More design than styling", this modern trend was consequently realised with the W124 Coupe (1987-1996) and Convertible (1992-1996). The R129 SL, obviously, began to be cramped for space for the "new high society". The rised obsession to move in an open car brought us as the wonderful 4-seat W124 Convertible, as (in 1997) the C208 (CLK) being a C-class coupe and convertible in one person although looking on us with the four eyes of the E-class W210. Then CLK should mean Coupe + Light + Ger. "Kabriolett". Or is the total break done now ? CL = "Coupe-Limousine" ? Or CL = C-class + Light with Ger. "Kompressor" reflecting on the 540K ? Note that all these middle-class (or E-class) and C-class coupes and convertibles "don't have the right" to carry the large star at their frontsides ! But they are fantastic successors as of dad´s W123 Coupe as of grandfather´s W111 Cabrio. C, hopefully, remains standing for Coupe. The S-class coupe C215 then had better been named "SC", comparable with SEC but omitting the E, because injection (I) is minewhile standard as in the E-class as in the A-class ! And, eventually, every car driver at first is an "Anfaenger" = Ger. "beginner", even with the ultramini "Smart". After this 80-km-per-hour exercise, actually only several lucky dogs have the chance to become real "Einsteiger", either into a W203 of Compact size or into a W210 of the "Economy"-line ! But nearly nobody succeeds to become a "Senior" - except with a W108/109, W116 or W126 !!! If CL means Coupe-Limousine than the CL is in reality an "SCL". But what's with the brandnew W203 C-class "Sport Coupe" ? Should this model actually become an R203 "Compact-Light" at some time ? Then it would at least not surprize that this "Entrance-Coupe" suddenly carries the large star at the frontside as it were a "CLC". "At DC all is S-class now" ! This, for the time, is the only answer I´ve found. So let's wait for the "W203 SL", sorry, the "R203 CL" - no ! : the "C-class Einsteiger Sport Cabrio" ... I'm seemingly little confused now !!! A beautiful 450SLC from the "Sternschuppen".